Preservation, Protection, and Performance, to its Highest Potential? Piano room placement has been said to be a greater critical decision for piano owners, than maintaining and caring for a piano, long-term. Correct piano room placement can result in achieving the best sound, performance, and most of all, longevity, of your piano during its lifetime, and most importantly, during your lifetime. On this page, we will discuss both the advantages and disadvantages of different piano placement options, and their respective locations, below. 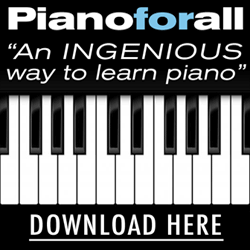 Several diagrams can be found on this page, showing where to place, and where NOT to place, your piano in a house, room, or building. 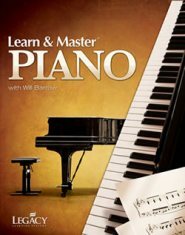 A few general criteria must be taken into consideration, to achieve and enjoy your piano's performance potential, to the fullest. Piano room placement means to keep your piano preserved in an excellent aesthetic, internal, and mechanical condition. While we understand your piano's placement is affected by the structural and space constraints of your home, institution, or studio, we encourage you to consider the following criterion. Do not compromise on any more than two of these prohibited placement areas, below, as any more than two 'compromises' can render your piano's condition and sound, lifeless. The life expectancy of your piano's condition and performance is greatly impacted and reduced by placement factors, alone, and should be carefully considered with your piano technician. In or around direct sunlight, even for but a few hours per day. This accumulated time your piano is near, or in the path of, direct sunlight can cause your (1) piano's finish to quickly fade, the (2) soundboard to become prematurely dried out, worn, and cracked, and (3) glue joins to weaken, throughout. Sunlight shining through a window can cause temperatures to rise, and the piano's immediate area - internally and externally - to become heated, and dried out. Windows can throw off heat, let cold air and warm air in, and are subject to changes in atmospheric conditions, temperature, and humidity from the outside, daily. These constant changes greatly reduce your piano's tuning stability, and cause parts to swell or to shrink, which can result in a poor mechanical and performance condition. Underneath, on top of, or near air vents. Similar to being placed near a window: air vents, air conditioners, heaters, and fireplaces all contribute to an unstable environment and climatic ("climactic", quite literally) conditions, around your piano. 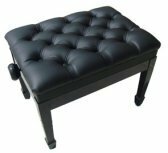 The less air flow, and changes in temperature and humidity around your piano, the better. Grand pianos, when placed in a room, are (1) preserved and (2) sound best when the 'straight edge' is placed against an inner wall. The same holds true for upright pianos, which should be placed on an inner wall, away from direct sunlight, windows, and air vents. Also, grand pianos should be positioned so that (2) the pianist can look into the room (and not into a wall), (3) and the bass side of the piano (left, straight edge) runs parallel to the wall. This placement enables the bass (low frequency sound) to bounce from the wall, into the room, and the treble to be projected clear out into the middle of the room. A grand piano can also be placed at a 45 degree angle, 1/3 or 1/5 of the way between a diagonal corner. If you were to turn your piano the other way around - where the bass side is placed near the center of the room - and the treble ("open lid") faces the wall (or a corner of the room), this may help to quiet the sound - to a greater or lesser extent - but ultimately, this position causes a harsh, stifled effect, since the treble is being bounced against the wall - exactly where the bass needs to bounce from - and the treble is unable to carry and project, out to the center of the room. The diagrams below illustrate correct piano placement options, in particular, in a small or a large room. The first diagram seen above is for grand piano room placement. 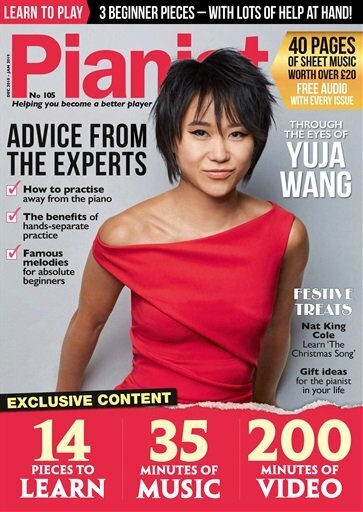 However, in the same large room, the image below (piano seen in RED) represents improper piano placement. If there is no space - or few to zero options - for the piano's room placement due to the house's design and/or physical space constraints, a floor length piano cover may be necessary and is highly recommended as one of many tools of preservation, by piano technicians and manufacturers. Assuming the walls seen below are an inner wall, this is a good first step toward placing the piano away from windows and sunlight. Vents, doors, and air flow is another issue. Pianos should be placed away from air intake vents, as the constant move and flow of air currents of different temperatures and humidity levels can cause premature deterioration of your piano's inner, delicate parts. 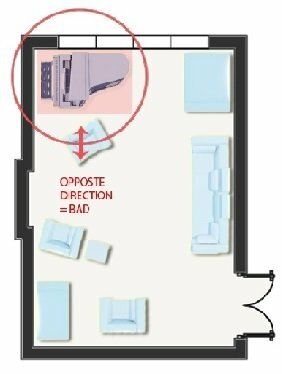 The image to the left is an example of 'bad' piano room placement, and can also be seen in the image below. In both examples, the (1) piano's treble is reflecting off a wall, (2) the bass side is not aligned against a wall, and (3) the pianist cannot see into the room. The piano is positioned out in the open, with no significant physical 'room support', to produce optimal sound and physical protection. Rare acoustical exceptions of placing a piano in the middle of a room are the following: Hard wood floors and/or high ceilings, and optimal acoustic surroundings, specifically, conducive to sound amplification and continuation, are present. There are, however, exceptions to placing a piano in this setting. If the piano is equipped with a climate control system, placing a piano in an open environment, namely, in the middle of a room, along with a cover, is somewhat permissible. The less air flow and atmospheric changes around the piano, the better. Tuning stability will remain relatively constant, and deterioration, less likely, over time. A home or building's inner walls and carefully controlled atmospheric conditions are a piano's best friend. When the two criterion above cannot be met, a floor length piano cover and humidity control system become increasingly necessary. Pay a few cents per day, up front, for such protective and precautionary measures, and you will save $1,000s in rebuilding costs, later. If you are considering purchasing a new piano, or bringing a piano into the home, after reading this article, try to locate or make a piano space template. 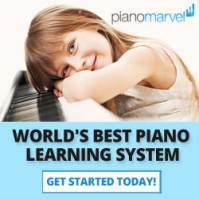 Visit a piano dealer. 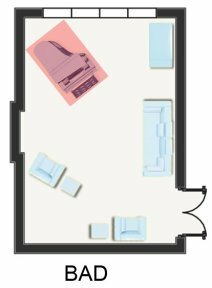 They will loan out - often, for free - a piano space template to help you decide which is the best place and space, to position your piano, before it arrives. Taking this one measure alone, in the beginning, can save you a tremendous amount of moving and maintenance costs, before it is too late. Or, visit a dealer and measure the distance, on an existing piano, where caster cups can and should be placed, before your piano arrives. Upright piano room placement is slightly different and less involved than grand piano room placement. Upright pianos should be placed against an inner wall, away from direct sunlight, air vents, doors, and windows. These measures help to preserve your piano's overall condition, tuning stability, and longevity. The majority of sound from an upright piano comes from the back of the instrument. The soundboard is openly exposed from the back, which reflects in greater measure the small portion of sound, which also comes from the piano's (1) top lid and (2) front bottom board, being slightly opened by a small gap. On most studio upright pianos, the top lid is allowed to stay open by means of a lid prop, which allows for more sound to come through this channel, in fuller measure. The diagram above shows three good examples. Let's discuss the first diagram, to the left. In the the first diagram, the upright piano is against an inner wall. It is positioned away from windows and air vents, and is situated in an inner portion of the home. The middle diagram shows the piano's back facing into the room. In this position, more sound can be heard, both by the pianist and by listeners - from anywhere within the room. A carefully cut liner can be placed by Velcro strips onto the back of the piano, to cover the unsightly beams of the piano's architecture. The liner allows for sound to come through, with no hindrance. 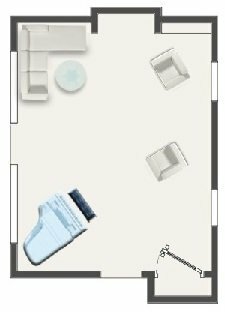 In the middle diagram, optionally, the piano can be placed against the wall to the left, assuming it is an inner wall. Arguably, outer walls, are the same as placing a piano in the middle of an open space. While placing an upright piano against a wall quiets the sound and gives a greater amount of protection (than an open space), an outer wall is better than no wall, at all. 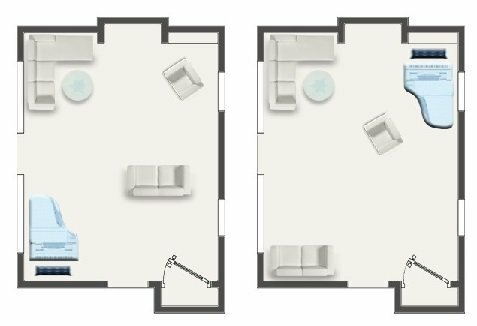 The last diagram, on the right, shows the upright piano facing into the room, in an open space, placed away from walls. Placing an upright piano in this position, generally speaking, allows for the greatest amount of sound to come through and travel, in a room. A cover and humidity control system is best in this scenario, as well. The best options for piano room placement, and no options for piano room placement, equally boil down to one main factor, alone: care and consideration. If you have the ideal setup and space to place your piano in a carefully selected spot, excellent. If you DO NOT have an ideal setup and space to place and position your piano in a carefully chosen environment, simply take a few precautions. Invest in a piano cover. Invest in a climate control system. Invest in mini-blinds, drapes, UV blocking and heat blocking window film/tint, vent covers, and/or blankets to make the best of your current situation. Invest in caster cups to protect your floor, property, and person. Choosing not to invest in any one of these options - the correct space option or the correct 'staple' - can result in a severely worn, damaged, and ultimately, a prematurely 'deteriorated' piano, one that will cost you - the piano owner - more money to maintain and repair, as a result. Make the best decision then, to take all of the necessary precautions and procedures to place your piano in a suitable and sustainable environment, to enjoy your piano, long-term, for decades. More tips on making your piano room sound "grand" can be found, at PianoBuyer.